I wanted to give Hereditary a few days to sink in so that I could gather my thoughts on it properly, because its unique and twisted blend of gallows humor, horrifyingly upsetting images and pitch-black tone is unlike almost any other horror film I’ve seen in a long time. Beckoning back to classics such as The Shining and Rosemary’s Baby, Hereditary serves as a massively impressive feature debut from Ari Aster, and one who’s nightmarish portrayal of a domestic unraveling is something that needs to be seen to be believed. Through Hereditary’s beautiful cinematography Pawel Pogorzelski paints the house as thematically similar to the miniature models Annie builds as a therapeutic hobby and source of income. The use of depth of field and flat angles creates an ominous and unique look like we’re staring into a diorama rather than viewing a typical house. This is a concept that’s played within the opening seconds of the film and plays a larger role later in the film that I won’t get into for the sake of spoilers. Hereditary is not in the same vein as something like The Conjuring; it is not a fun film with a steady supply of jumpscares, followed by a release and a happy ending; it is an unrelenting and cruel experience that finds its darkest parts in the final moments of its runtime. There’s no breath of relief, which is one reason why I waited several days to write a review. Hereditary left a bruise, one which has lingered with me since the screening. While I can’t say that Hereditary is the most flat-out scary film I’ve ever seen, I can say that the unrelentingly awful events which these characters endure were intensely upsetting to watch – in a good way. 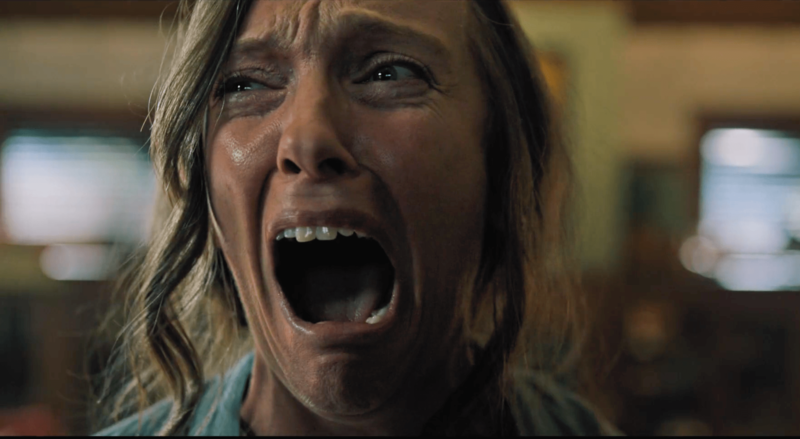 It creates a sensation of active dread and despair with scares peppered throughout, all culminating in a finale in which Hereditary goes all out with the kinds of things you’d expect out of a more traditional scary pic, the difference being the buildup and execution, lending to a far more effective impact. It threatens to fall off the rails when things really begin to go crazy, but quickly rewrites its course and managed to scare the living daylights out of the entire crowd I experienced it with. The extremely graphic nature of its conclusion makes me hesitant to recommend it to any but the most desensitized, but those who think they can handle it will likely be more unsettled by this film than anything else to hit theaters this year.